David Carter has witnessed many ministers make or destroy their reputations. His job entails playing referee at Parliament. When temperatures are rising and things are getting out of control, Mr Carter – Speaker of the House of Representatives – steps in to say enough is enough. 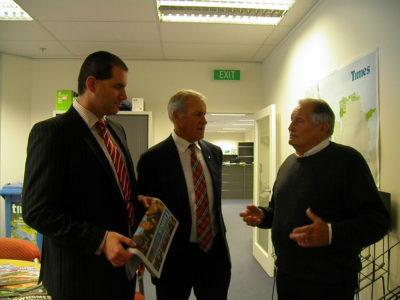 In Botany on Friday at the invitation of Botany MP Jami-Lee Ross who has been bringing senior politicians to the area, Mr Carter had flown in from Christchurch to visit a local business. Dropping in at the Times’ office after visiting GMP Pharmaceuticals in East Tamaki, Mr Carter says he is very impressed with the kind of investment the leading manufacturing company is making. “(Managing director) Karl Ye now plans to make an added investment in New Zealand for which they will employ 400 more staff,” he says. 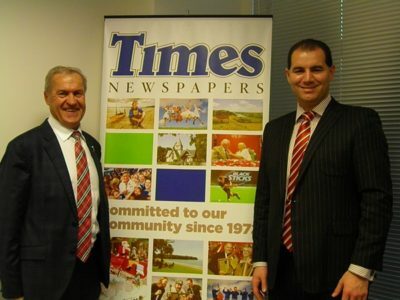 Jami-Lee Ross and David Carter in conversation with Times publisher Brian Neben. The man with the third most important job in the country says that a lot of people don’t have a clue about what the Speaker of the House of Representatives really does. He intends to return to this area next month at the invitation of the Pakuranga Rotary Club and also address schools about the ceremonial role of a speaker. “My dad had been a councillor in Christchurch for 40 years. It was at a time when councillors didn’t get paid,” he says. “My father sparked my interest in politics. I first stood for elections in 1993 and lost. But then I won the by-election (in 1994) and that’s what Jami-Lee and I have in common,” he says. He held many ministerial portfolios over 20 years. “I was sort of the lone ranger then. But in hindsight, it helps to build resilience,” he says. Talking about his apolitical role as speaker, he says his job is to “measure the tone and temperature, and sense things when they are moving out of control in Parliament. “There are times when people are yelling and tempers have flared. This year I have asked people to leave the Chamber twice and that is a really good record. The Speaker technically owns all of Parliament’s grounds and buildings — Parliament House, the Parliamentary Library, the Beehive, and the lease on Bowen House. “There are around 100,000 people who come to Parliament every year,” he says about the second largest tourist attraction after Te Papa Museum in Wellington. “It’s my job to see that the Parliament is well resourced. “I also have an international role of meeting up with dignitaries before they meet the Prime Minister. “New Zealand has the best democratic system in the world. It is recognised as transparent, accountable and corruption-free. It’s my job to keep it that way. The keen aviator and a marathon runner, who has run the Paris and New York marathons, says he doesn’t take parliamentary battles home with him to Christchurch. “I have a pilot’s license and like spending time with my family. My youngest boy is only 13,” he says. Having transitioned from a long-time politician to being an impartial referee that moderates heated debates whilst observing parliamentary rules and tradition, Mr Carter says he is not there to give the government an easy ride. “I am apolitical and give Labour Party and Green Party and everyone else a fair go, provided they go by the rules and don’t do anything unparliamentary. I remind myself of it every day that I am not affiliated to the National Party,” he says. The list member for the National Party hopes to continue as Speaker of the House in the next term and admits there may be fireworks in the next month of Parliament. But he loves every moment of it.